Peak Mobility is specially designed to keep your joints well protected and lubricated. It combines 5 dynamically powerful, effective ingredients to help you reclaim the mobility you deserve. WHAT IS GUNDRY MD PEAK MOBILITY? Keep you feeling young, limber, flexible, and independent for years to come. How does Gundry MD™ Peak Mobility Work? Glucosamine keeps your cartilage strong, which helps slow how quickly your joint tissues wear down. This compound helps reduce aches, making those everyday tasks (like tying your shoes or walking up a flight of stairs) that much easier. Hyaluronic acid “lubricates” your joints and keeps them greased up, so your body can move with ease. Think of it like WD40 for your joints. The polyphenols in this potent extract help combat the free radicals that can lead to age-related aches and discomfort. Boswellia Serrata helps provide added flexibility and a reduction in joint soreness and stiffness. WHAT ARE THE INGREDIENTS IN GUNDRY MD™ PEAK MOBILITY? The most popular order for new customers is the 3-bottle package. However, longtime customers usually opt for the 6-bottle option, which gives you even greater opportunities to save. HOW SAFE IS GUNDRY MD™ PEAK MOBILITY? ARE THERE ANY SIDE EFFECTS? Peak Mobility was formulated for maximum all-natural purity. It should be effective and safe for daily use for the vast majority of people. Of course, I recommend consulting with your physician before using any supplement, including Peak Mobility. 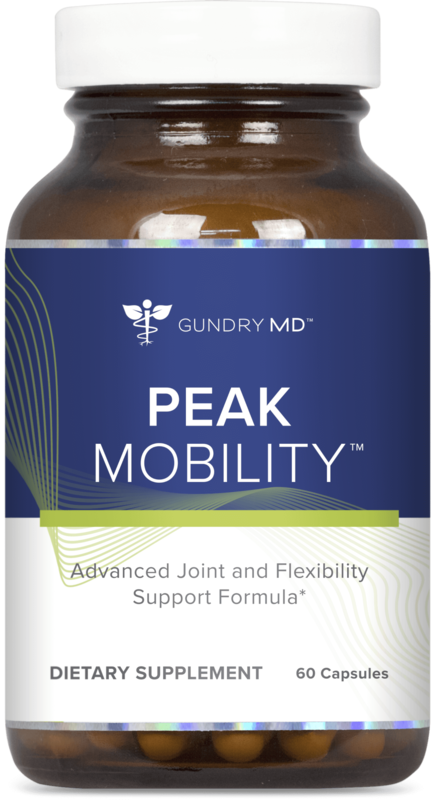 HOW DO I USE GUNDRY MD™ PEAK MOBILITY? Peak Mobility is formulated as a safe, easy-to-swallow capsule. For maximum effectiveness, I recommend taking 2 capsules once per day, with your biggest meal. You can also take 1 capsule twice a day if you prefer. Many users report a distinct improvement in joint health within just a few days of first taking Peak Mobility. However, for many users, the most dramatic results were first noticed over the course of 2-3 weeks. Please use as directed. WHAT IF GUNDRY MD™ PEAK MOBILITY DOESN’T WORK FOR ME? IS THERE A GUARANTEE? I’m confident Peak Mobility will offer you the powerful support your joints need for REAL relief. But I also understand that no two people’s systems work the same way, so a small number of people might find Peak Mobility does not give them the benefits they need. That’s why each bottle of Peak Mobility comes with my personal 90-day guarantee. If, for any reason, Peak Mobility does not offer you comprehensive joint health support, just return what you haven’t used within that time for a full, no-questions-asked refund. I found this to be a great combination of all the supplements I was taking, and in my opinion, it was better absorbed, making me feel even better.